LOVE those target flats! Definitely did not ever see those at my target or I would have snatched them up! I am wanting those Toms too! I read they ran big, so I'm a little anxious about ordering but I will probably break down and do it soon. I missed the Target flats, they sold out fast in my size. Those are CROCS??? Too cute! I just got my Toms in the mail yesterday! I haven't tried them on yet, and I have never worn Toms before, so I hope that I got the right size. I also love those Target shoes, but usually have a hard time with man-made materials on my feet. I am going to look into the Crocs now. Don't even care that they are Crocs. I need comfy shoes for Disney and those would definitely be it! @Angelbear425-the TOMS definitely stretch a bit so don't panic if they are super tight at first. I wanted those webster ones but they were sold out in my size. I got the Tory burch stripe ones, they are called the alaine sneakers. @Kate, Thank you! They were super tight (I usually wear between 8/8.5 and people said they ran a little big so I sized down). I could hardly get my foot into them to the point of pain. I called and they were super nice and did the exchnge right over the phone for me. They are even sending me a pre-paid label to ship these back! I will be waiting for the 8.5 before deciding. Good to know they stretch though. I just ordered the Crocs last night as well. 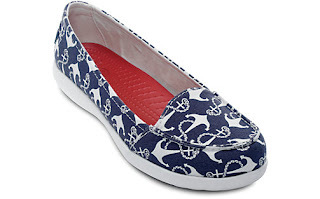 I am beyond obsessed with anchors. I love that everything has anchors now. TOMs, Sperrys, and Keds are my go-tos. I love those flats though.